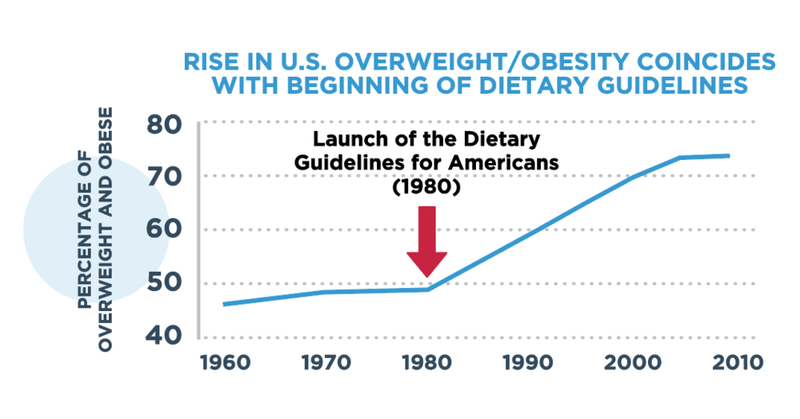 For the past 35 years, the federal government has published the Dietary Guidelines for Americans (DGAs) —the principal policy guiding diet in the United States—with the goals of promoting good health, helping Americans reach a healthy weight, and preventing chronic disease. But since the introduction of the DGAs, there has been a sharp increase in nutrition-related diseases, particularly obesity and type 2 diabetes, that the DGAs have been unable to stem. What went wrong? The answer is that in many cases, the Guidelines have been shown to be based on weak science, and the government’s evidence reviews have failed to comprehensively or systematically consider the best and most current science. prevent obesity, type 2 diabetes, heart disease, or Alzheimers. These Guidelines must be reformed so that they are based on the best and most rigorous science. Only then will they be able to help Americans fight nutrition-related diseases.